Franciscan Health System CEO Joe Wilczek announced plans Wednesday to retire in January 2015. 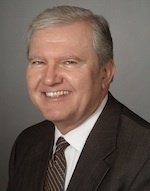 Wilczek has led the Tacoma-based Catholic hospital group for the past 16 years. Bremerton’s Harrison Medical Center affiliated with Franciscan and parent company, Catholic Health Initiatives, last year. Franciscan expanded from three to nine hospitals under Wilczek’s watch and developed a clinic network with more than 100 sites. Franciscan employs more than 12,000 people and generates annual net revenue of $1.8 billion, according to the release. Catholic Health Initiatives will conduct a search for a replacement this year, with input from its affiliate boards, including Harrison’s. CHI expects to name a replacement by the end of 2014. The heavily-taxed legal marijuana industry could generate close to $2 billion for the state over the next four years. Local governments won’t see a dime of pot revenue directly, beyond what they collect from sales and business tax. That’s something many local leaders want to see changed. Mayor Patty Lent of Bremerton and Mayor Tim Matthes of Port Orchard signed a letter to Gov. Jay Inslee and leaders in the Legislature asking for some revenue to be directed toward local enforcement. Nearly 100 Washington mayors signed the request, compiled by the Association of Washington Cities. “The majority of marijuana sales and use will occur in our jurisdictions. This makes us responsible for overseeing permitting, code enforcement, ensuring money and drugs stay out of criminal hands, preventing distribution to minors, and addressing drugged driving and other adverse public health consequences. If the state is relying on local cities to enforce new marijuana laws, it needs to provide some of the new marijuana tax revenues to pay for it – this is a matter of common sense and fairness. 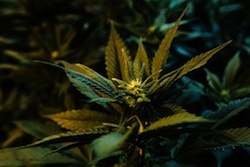 It is estimated legalizing marijuana will give the state significant new annual tax revenue. We’re asking for a portion of those revenues. Bainbridge Organic Distiller’s Legacy Vodka earned that distinction at the World Vodka Awards in London Thursday. The vodka beat out more than 1,000 brands from 25 countries, according to a news release. This is an excellent spirit that’s well balanced and full of individual character, great potential for cocktails. It has a powerful but soft nose with berry fruits and grain coming through. Rich, creamy, marshmallow flavours develop nicely on the palate. The Legacy Vodka also won the award for best packaging design. Bainbridge Organic Distillers opened in 2009. The company produces vodka, Doug fir gin and whiskey in small batches. 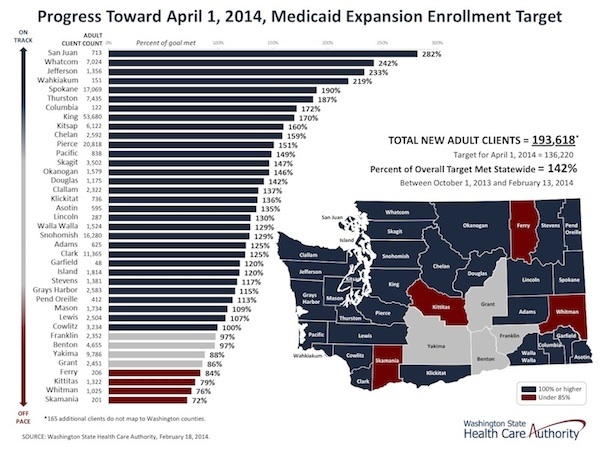 With 6,122 residents enrolled in expanded Medicaid programs, Kitsap County is well ahead of its enrollment goal. The county has already exceeded its target number by 160 percent, according to a release from the state Health Care Authority. Kitsap has enrolled a total of 16,406 residents in Medicaid since the start of the Affordable Care Act rollout in Oct. 1. That figure includes new and renewing enrollees. Though open enrollment for private health plans offered through the state exchange ends March 31, applications for Medicaid are accepted all year. 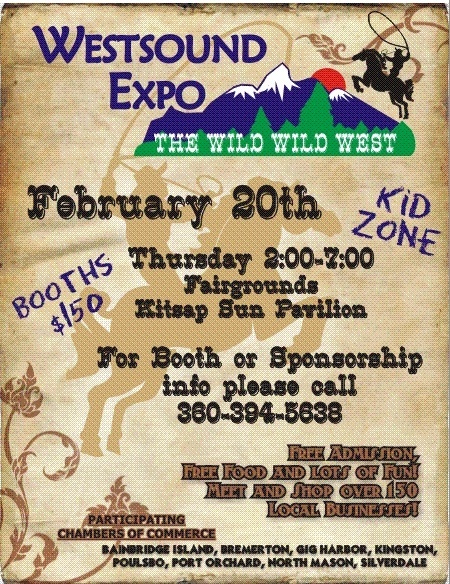 The Westound Expo returns to the Kitsap Sun Pavilion at the fairgrounds Thursday, with more than 150 businesses participating. The event features a long list of exhibitors plus free admission and free food. 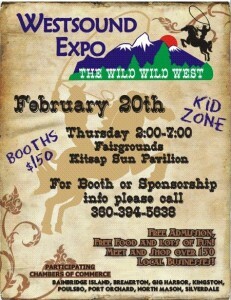 The expo runs from 2-7 p.m. The expo is organized by local chambers of commerce. You can click the image to expand the poster. Roller derby competitors take their share of lumps and bruises. The rowdy sport also attracts a young crowd. Those elements made roller derby a natural fit for promoting the state Healthplanfinder website, said spokeswoman Bethany Frey. “It fit in really well with the demographic we’re trying to reach,” Frey said. The exchange will have a booth and promotional activities at Roller Vixens events through the end of March, including the popular Wild West Showdown. The deadline for signing up for qualified private plans through the exchange is March 31.